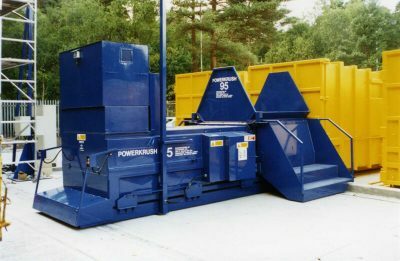 The Powerkrush 95 is the largest static compactor in our range. The huge charge area is most suitable not only for large bulky items but also for heavy industrial waste that requires extra pressure for volume reduction. Typical applications include civic amenity sites and transfer stations where massive volumes of waste product can be compacted tidily and speed of disposal is essential. Heavy duty hoppers can be designed to suit individual loading applications. It is used in conjunction with a 40 cubic yard container. † If this machine is situated outside of the earth equi-potential zone it must also be protected by a triple pole RCD with a 30 milliamp tripping facility. (NOT A SOCKET). For more information, contact our specialist team today!